It’s no secret. Bad credit and financial stress are keeping millions of people around the world awake at night. Getting the sleep you need is hard to do if you’re always worried about your finances. Research shows that as many as 60 percent of people with insomnia claim that financial struggles are a contributing factor (1). One poll found that 23 percent of Canadians are losing sleep over economic struggles. This number rises to 33 percent among those without a degree (1). Chronic stress is one of the most prevalent causes of sleep loss. Over time, loss of sleep contributes to significant health problems and a reduced quality of life, which creates a vicious cycle by putting more financial strain on those who are already struggling. Constant calls from debt collectors and credit card companies can further enhance your sleep deprivation. Here’s how repairing your credit and alleviating your financial stress improves your sleep. People experience many different forms of stress throughout the day. Being stuck in traffic, running late to an event, and even speaking in public or to strangers can evoke a stress response in some people. Of all the factors that cause stress throughout the day, financial worries might be the most common. They are also on the rise. According to a 2017 Employee Financial Wellness Survey, approximately 54 percent of employees who are stressed about finances plan to postpone their retirement (2). Another 51 percent of workers have less than $51,000 saved for retirement and 57 percent think they will need to use their retirement money on other expenses (2). Financial issues are so distracting that approximately 46 percent of workers spend three hours or more a day worrying about their personal finances while on the job (2). Chronic stress causes many health issues. Some research even indicates that financial stress causes painful feelings. A 2016 study published in Psychological Science found that financial stress physically hurts (3). The study analyzed data from 33,720 households in the United States. Results showed that people with higher levels of unemployment were more likely to take over-the-counter pain medications. Researchers used a series of tests to determine that merely thinking about financial insecurity was enough to increase pain levels in test subjects (3). Additionally, the study found that people who were asked to recall a financially unstable time in their life felt twice the amount of physical pain compared to when they were asked to think about a period when they were financially stable (3). Another experiment involving students who were anxious about landing a job after school exhibited less pain tolerance than students who were not stressed by pulling their hands out of a bucket of ice water quicker (3). Researchers concluded that people with money woes had a reduced sense of control and increased feelings of physical pain. Further research found that financial stress makes you appear older. According to a 2016 study, people with financial troubles aged more over ten years than individuals who were not stressed (4). 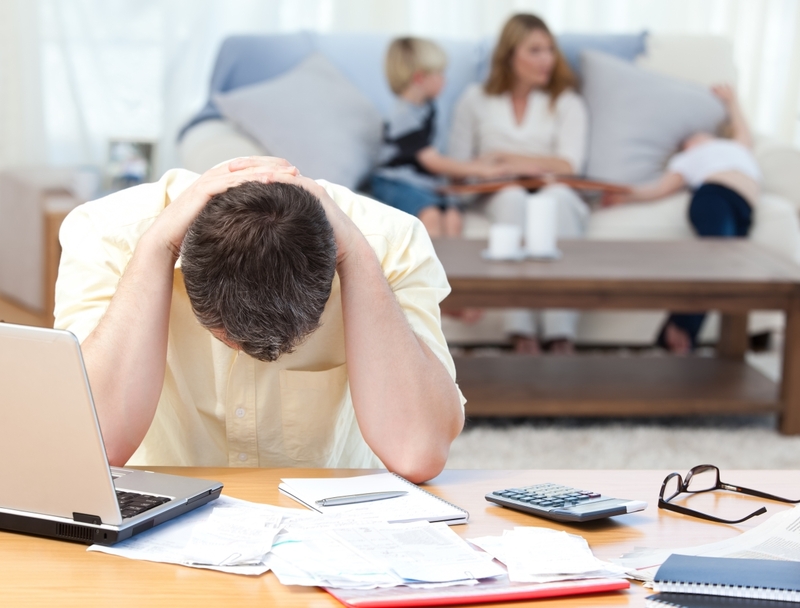 Results showed that financial stress was worse than other types of stress that were reported. More than 200 subjects rated their financial stress in the year 1994. Pictures were then taken of them. They were asked to re-evaluate their financial stress levels ten years later. More pictures were taken. A panel of people who did not know the subjects were asked to guess the age of the individuals in the pictures. Reviewers agreed that those who reported being financially stressed had appeared older and had aged more (4). Being financially stressed causes you to make poorer decisions about your health, which ultimately leads to sleep loss. According to the Indiana University Bloomington School of Public Health, two studies have confirmed that financial and job stress increases the urge to smoke and make poorer decisions regarding diet and exercise habits (5). Prior research on insomnia shows that poor nutrition, lack of exercise, and smoking may contribute to sleep loss. But even bad lifestyle habits don’t begin to explain why people are losing sleep over their money problems. Many people are too wound up to fall asleep at night after a long day of worrying about their finances. Some people view sleep as precious time that could be spent working. Despite already working 40 hours a week, many people don’t make enough money to cover their bills. This may prompt them to stay up late doing freelance work or finding other ways to make money. Single parents or people who work from home with children may need to work at night after their kids go to bed. The possibilities in which financial stress keeps you awake at night are endless. The problem with chronic stress is that sleep is crucial for your health, which is needed to help you make smart decisions and keep your quality of life up. Sleep is necessary for your brain and body to recharge. Without it, you’re more likely to have memory problems or pay less attention to detail, which means that your job performance might suffer. Chronic insomnia also increases your risk of many chronic illnesses, such as obesity, diabetes, or high blood pressure. This contributes to medical bills that most financially-stressed Americans can’t afford. Stress-induced insomnia has been shown to alter the areas of your brain responsible for sleep. According to a 2012 study, stress activates the hypothalamic-pituitary-adrenal or HPA axis, which is needed for proper sleep regulation (9). It enhances excitatory neurotransmitters in the brain and increases alertness of the nervous system, which means that you’re less likely to rest. Stress also weakens your immune system, which makes you more likely to take days off from work to nurse a cold. During sleep, your immune system produces anti-inflammatory proteins and antibodies that fight illness. When you’re sleep deprived, your body makes fewer of these protective compounds. Sleep plays a significant role in your overall happiness and mood. Studies show that most people would be safer, healthier and happier if they got an extra 60 to 90 minutes of sleep at night (6). Sleep loss that leads to depression and anxiety takes a toll on your motivation. It also makes you less attractive to an employer if you’re trying to land a job. According to the American Psychological Association, approximately 53 percent of people who don’t get enough sleep reported feeling sluggish or lazy. Another 38 percent felt irritable while 29 percent have trouble concentrating and 25 percent have no motivation to take care of their responsibilities (7). Sleep is the driving force behind making smart decisions about your finances and future. When you’re deprived of it, you’re less likely to help yourself out of a tight situation. If you want to turn around your financial situation, then you need to start with a good night’s sleep. How Does Bad Credit Contribute to Financial Stress? Having good credit is crucial for sustaining the American way of life. You need it if you want to buy a house or a car. It can be the deciding factor in whether you are hired by an employer or how much insurance you pay each month. Bad credit makes you look like a risk, which can significantly contribute to your financial stress if you’re denied meaningful opportunities. According to a report by Forbes.com, 83 percent of employed people are financially stressed, and 16 percent claim that their stress is overwhelming (8). The report indicated that this is bad news for both you and your employer as financial stress is one of the leading causes of health issues and your boss loses roughly $5,000 a year on you in productivity costs (8). Debt is the primary cause of financial stress for many people. Approximately 80 percent of people are uncomfortable with their debt, and 82 percent don’t have a backup fund. Because 49 percent of people can’t pay their bills on time (8), this means that bad credit often causes financial stress. When coupled with health stress due to lack of sleep, bad credit can seem overwhelming. Bad credit doesn’t just rob you of opportunities. It also steals your health. A 2012 study published by the American Psychological Association found that 69 percent of Americans were stressed over money. Raising your credit score increases your credit card limit. It’s the credit card company’s way of saying they trust you. It also lands you more attractive mortgage and refinancing rates on your home. You may get a better finance deal on a car lease or a vacation rental property. Good credit gives you more leverage when taking out a loan or applying for a credit card. You’ll sleep much better at night knowing you got the best rate possible. Improving your sleep should be number one on your list of things to do, but you can’t also do that until you address the cause of your insomnia. If bad credit and financial stress are keeping you awake, then you may want to ask for help from a credit repair company. They can provide services and education on how to get your debt and credit score under control. Although it takes time to rebuild your credit, you’ll need to start somewhere. Work with debt collectors by asking to be put on a payment plan. Your accountant may be able to help you adjust your budget to make ends meet. Set your goals small to increase daily satisfaction and stay motivated. While you’re building your credit score and reducing your financial stress, you’ll also want to work on improving your sleep. If you’re unhappy with your job, you’ll want to look for a new one. But don’t do it late at night when you’re supposed to be asleep. Your sleep cycle is sensitive to factors such as stress and light. When it gets dark, your brain produces a hormone called melatonin to help you sleep. But even the smallest amount of light such as from a laptop or a smartphone can tell your brain not to make it. When you’re financially stressed, it’s easy to put your health on hold or make decisions that aren’t always in your best interest. Buying bulk foods is a good way to stock up without going over your budget. Choose plant-based foods such as brown rice and black beans. Frozen fruits and vegetables can be stored in the freezer longer than fresh produce and easily added to dishes when needed. Contrary to popular belief, frozen foods are just as nutritious as fresh produce if they are frozen during peak times. Although they are cheap, avoid processed fast foods that are hard to digest, which can keep you up at night. Exercising is an excellent way to reduce stress. It will help you sleep at night and control your body’s stress response so that you’ll be better prepared to make smart financial decisions. You don’t need to join a gym to get fit. Going for a walk or bike ride several times a week can help. Meditation is free and has profound effects on sleep. Research shows that people who meditate produce higher levels of melatonin. They also tend to sleep better than people who don’t have a healthy stress outlet. Some community centers offer free health classes or group activities. Try a natural sleep aid before turning to prescription sleep pills. They are less addictive, have fewer side effects, and won’t make you feel as tired when you wake up the next morning. Writing in a journal has been shown to help reduce stress. It can also help you keep track of your financial goals. You can incorporate journaling into a bedtime routine, which is recommended by sleep experts to help improve insomnia. Start relaxing after dinner. Enjoy a hot cup of tea, take a warm shower, and put off your financial struggles until the morning.